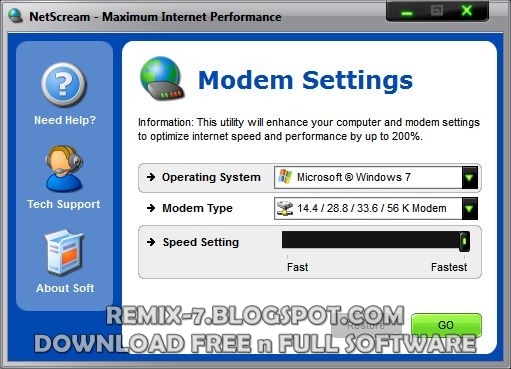 NetScream 1.1.17.2011 Merupakan sebuah software yang bisa mempercepat koneksi internet anda yang menggunakan modem merk apa saja, NetScream 1.1.17.2011 ini juga meningkatkan kecapatan download dan ulpload Files, Video, mp3 dll. 1. Makes direct changes to system registry and system files to enhance internet download and upload speeds. 2. Automatically adjusts settings and changes made based on computer and modem specifications, complete fault tolerance system implemented. 3. Compatible with all modem types - Dial-up, DSL, ADSL, Cable, ISDN, and Satellite internet connections. 1. Enhances both internet transfer speeds as well as local area network speeds. 2. Easy and intuitive user interface which performs all setting changes immediately. 3. Try before you buy licensing with FREE lifetime upgrades and quality technical support.